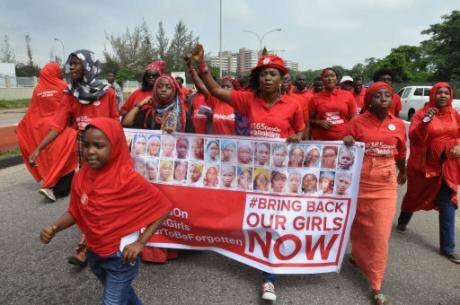 Two and a half years after the brazen abduction of 276 Chibok girls by Boko Haram militants, the Bring Back Our Girls Movement (BBOG) continues to advocate for their release, asserting its non-negotiable, unequivocal demand: “To bring back our girls now and alive”. The recent return of 21 of the girls, in a deal reportedly brokered by the Swiss government and the International Committee of the Red Cross, reminded the world about the horror of their abduction from their school dormitory in Borno State, north eastern Nigeria. While 57 girls managed to escape, 197 remain in captivity. In May 2016, Amina Ali Nkeki, one of the girls, was rescued by the local joint task force. Hope remains high, as President Muhammadu Buhari has promised the government will “redouble efforts to ensure that we fulfill our pledge of bringing the remaining girls back home. Already, the credible first step has been taken and Government will sustain the effort until all the remaining girls return safely”. The abduction of the girls thrust Nigeria into the glare of the global news media, highlighting the inability of the government of President Goodluck Jonathan to protect its citizens. An international outcry, under the social media hashtag #BringBackOurGirls, was driven by the BBOG Movement. Born out of a need to ensure the plight of the girls was not dismissed, BBOG filled the leadership vacuum that emerged after the slow response by the government, and became an authoritative voice with its marches, daily sit-ins and online activism. Kadaria Ahmed, a journalist and media entrepreneur, describes the movement’s efforts as “amazing, particularly because they are operating in an environment where civic and civil advocacy is fairly new. Nigerians are not used to the idea that regular people get behind a cause and support it - not for personal gains but with a view to promoting a shared cause”. The co-conveners of BBOG are Obiageli Ezekwesili, Saudatu Mahdi, Maryam Uwais and Hadiza Bala Usman. Ezekwesili is the recognised face and voice at the forefront of the group’s work. She explained that the group has remained resolute in its stance because the goal has always been that until the girls return home to their parents, BBOG’s work is not over. “One of the chants of the Bring Back Our girls Movement is ‘when we shall stop?’ And the response is not until our girls are back and alive. When shall we stop? Not without our daughters. It came out of the pledge we made that until our Chibok girls are rescued, it’s an unfinished business. We must find them and enable them to have a second opportunity in life. We haven’t achieved that and consistent with our pledge, we are staying on and we are staying steadfast”. BBOG has been relentless in its campaign to keep the conversation about the Chibok girls in the hearts and minds of Nigerians and the international community. At the height of the story’s visibility in the news media in May 2014, #BringBackOurGirls was one of the most popular hash tags on Twitter, with over 4 million mentions. However, those numbers dropped drastically to a mere 25,123 by April 2015. While this confirms that social media activism and hashtags are not responsible for the security of a nation, it also poses a question if national amnesia and news fatigue had set in about the plight of the girls?We know our constitutional rights: we are not going to be brow beaten… it’s perfectly right to disobey illegality. BBOG’s work has experienced its fare share of challenges. I asked Ezekwesili about the girls’ abduction being called a ‘scam’ ahead of the last presidential election, as a way to destabilise the government of President Goodluck Jonathan. She said: “Initially, it would infuriate me. Then it began to make me feel absolute pity, that they lacked empathy. I felt they had lost an essential part of their humanity. Especially after the proof of live video by CNN, and when the mother of Amina Ali Nkeki identified her, almost fainting at the sight of her daughter. Then we got another video where Dorcas Yakubu was pleading to be rescued alongside her classmates”. Ezekwesili goes on to add: “These parents have been pining to see their children. It’s a waste of valuable time to focus on people who call it a scam”. In September this year, that scenario repeated itself when the administration of President Buhari tried to stop the group from marching in the capital city of Abuja. Ezekwesili points out that nothing changed: “it’s a government saying to us, why are you troublemakers, why can’t you just move on? We are not going to sit and be silent in the face of such indifference to the suffering of citizens. We came out on the basis of two pillars. The first is that of our shared humanity with our Chibok girls. The second is our social contract with the Nigerian state and people. For us, those two things are the guiding values of which everything that we do stands. We know our constitutional rights: we are not going to be brow beaten. No kind of tyranny can succeed in a democracy. It’s totally in violation of the constitution. And what we have said is that it’s perfectly right to disobey illegality”. This of course is a very different picture to when the governing APC party was in opposition in 2014 and supported the group’s cause. In the early days of President Buhari’s administration, he granted the group an audience. Given the recent backlash, there have been accusations that as an opposition party, APC used the cause to highlight the issue of security, a major talking-point during the election. Garba Shehu, President Buhari’s official spokesperson, asserts that the objective of the government is the same as that of BBOG – to bring the girls back home. When pushed about the change in relationship in recent months, and if APC had capitalised on the group’s influence with the Nigerian populace to win hearts and votes, he said: “There’s a modus operandi for the opposition and a different one for a government in power. At the time the BBOG group was formed, the campaign was the only means available to members of the APC to influence the efforts to rescue the missing girls. However, APC is now in government. The APC government has the military and other means at its disposal. Focusing on utilising these means effectively for the girls’ rescue is the current modus operandi of the present government”. Ahmed explains that the change in relationship is because “generally Nigerian governments are not used to receiving criticism except from organised political groups. We don’t have a history of advocacy on a large scale by regular people, so every criticism is seen as an attack on government. Now that the former opposition party is now in government, I suspect the expectation is that people would speak to them quietly about this matter. So again, I think there’s a big misunderstanding around what advocacy is and what it should be”.I just want the girls back. I’m hostage to principles. The release of the 21 girls validates the work BBOG has been doing for over two years. However, it has not protected Ezekwesili, who as the spokesperson of the movement has become a prime target for online abuse and scorn. So why does she remain dedicated to BBOG and not walk away? “I’m not the kind of woman that walks away. I’m a woman of my word. When I came out for our Chibok girls, I was driven by a sense of outrage. One thing you must realise is that certain people will not understand your value construct. I live for character: I don’t live for all the other things (possessions and positions) that others consider important in life. So it will be hard for people to sometimes understand that I don’t have anything to defend”. There have been whispers that she colluded with the APC government while in opposition, so she would get a ministerial position in government. An allegation she describes as a “paltry and pathetic kind of way to view life”. Ahmed on the other takes a different approach. It is her view that for BBOG, a collection of individuals who came together for a common good, having Ezekwesili, “a person who you know basically tends to generate strong feelings one way or the other, might not necessarily be a good thing for a movement that is seeking to do advocacy and maintain dialogue. In essence, I’m saying that with a movement like that, perhaps what you need is for the movement in itself to be the personality. I’m not sure it’s the sort of cause that does well being associated with any one individual too closely”.